Official Synopsis from Goodreads: In an enthralling new feat of historical suspense, Ariel Lawhon unravels the extraordinary twists and turns in Anna Anderson’s 50-year battle to be recognized as Anastasia Romanov. Is she the Russian Grand Duchess, a beloved daughter and revered icon, or is she an imposter, the thief of another woman’s legacy? Under direct orders from Vladimir Lenin, Bolshevik secret police force Anastasia Romanov, along with the entire imperial family, into a damp basement in Siberia where they face a merciless firing squad. None survive. At least that is what the executioners have always claimed. A young woman bearing an uncanny resemblance to Anastasia Romanov is pulled shivering and senseless from a canal in Berlin. Refusing to explain her presence in the freezing water, she is taken to the hospital where an examination reveals that her body is riddled with countless, horrific scars. When she finally does speak, this frightened, mysterious woman claims to be the Russian Grand Duchess Anastasia. 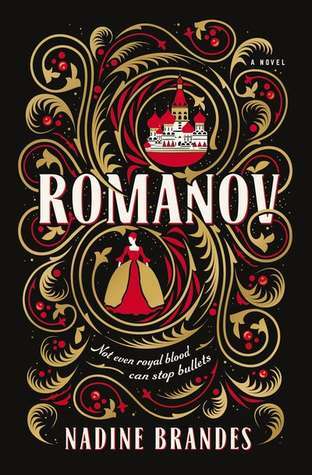 As rumors begin to circulate through European society that the youngest Romanov daughter has survived the massacre, old enemies and new threats are awakened. With a brilliantly crafted dual narrative structure, Lawhon wades into the most psychologically complex and emotionally compelling territory yet: the nature of identity itself. The question of who Anna Anderson is and what actually happened to Anastasia Romanov creates a saga that spans fifty years and touches three continents. This thrilling story is every bit as moving and momentous as it is harrowing and twisted. Setting: Jumping back and forth in time from 1917-1970. Mainly set in Russia, New York, and Germany. Review: A jumpy, hard to follow read with a fabulous ending. I Was Anastasia by Ariel Lawhon tells the fascinating story of Anastasia Romanov, and tries to answer the question of whether or not the real-life person of Anna Anderson was really, truly Anastasia. Told in a back and forth way, we see Anastasia as her father’s regime falls, and as she and her family are held captive. We also have a complicated time line with Anna Anderson, the woman who states that she is Anastasia, and her story works backwards towards the moment of truth, in that basement in Ekaterinburg, where the Romanov family was executed in 1918. I liked the dual time line stories, as Anastasia’s works forward and Anna’s works backwards, and I honestly am not sure how else Ariel Lawhon could’ve told this story and kept it suspenseful. I found Anna’s timeline, the one working backwards, difficult to follow. Lawhon would have a scene and then a few pages later have a scene that was several months prior to the scene we just read, and this went on for all of Anna’s chapters. It was tough for me to get through some of these sections, as I couldn’t quite follow all of the action and kept getting confused as to who was who. But now that I’m finished with the book, I see how important writing the book in this backwards way was, and I am not sure that there is a better way to tell this story. The big question is, is Anna really Anastasia, or just an imposter? This question kept me hooked to the story, and as it unravels, we learn more and more about the characters and history. I found my opinions changing throughout the book, at times liking Anna, and other times not liking her at all. I loved the sections that focused on Anastasia, and her life in captivity. There are some violent scenes here, ones that made me gasp with their cruelty. I think this would be a good book for book clubs, as readers will have different opinions about Anna, and there’s a lot to discuss here, from the way the book is written, to the characters and history. It took me until almost the end of the book before it really started clicking and working for me, and when I finished I Was Anastasia I realized that it was a book that I definitely would like to re-read at some point. I definitely recommend this book for those who enjoy back-and-forth in time narratives, and for those who enjoy reading about Russian history. Bottom Line: Hard to get through some of the jumping time lines, but the ending was spectacular. Does this sound like a fascinating read? Are you interested in Russian history? I have always been fascinated by the question of “Anna’s” identity. I read a book long ago about this question. Much as I don’t like back and forth timelines, ack, I often get so confused as to whose voice I am on, I just might read this book just to see what it says about “Anna”. Great review, thanks for pointing a good read. Thanks! It is such an intriguing question, about Anna’s identity. This one was difficult for me at the beginning, but that ending was definitely worth it! And the one narrative being told in a backwards way was different, if a bit confusing at times. I hope you enjoy it if you decide to read it! I ordered this book from our local library, but there is a waiting list, so I don’t know when I will be reading it. I’m looking forward to it though. Great review. This is one Fiction Fan might like as part of her reading the revolution challenge. The dual timeline thing is so hot right now; everyone’s doing it! The consensus seems to be that no one ever likes both timelines, though. Makes me wonder what will stop the trend. Yeah, she’d like this one! I totally agree with not liking both timelines. I usually tolerate one and love another, or like one but really love the other one.